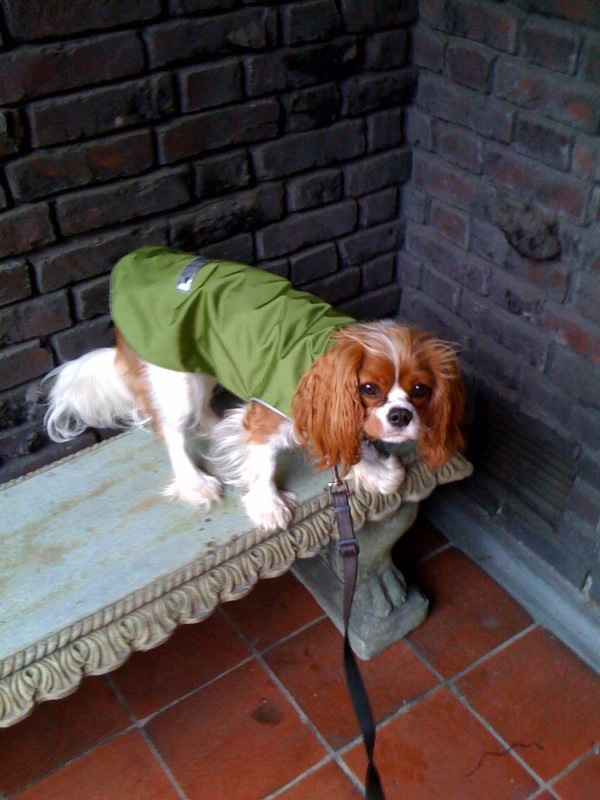 It’s bucketing down rain here in Seattle, so I have water-repellant dog jackets on my mind (Chloe’s a pretty sturdy little dog, but a jacket helps her stay out longer). The trick is to find a jacket that works with Chloe’s Easy Walk harness, which sounded gimmicky when I bought it but turns out to do a good job of keeping her from pulling. It fastens in front, low under her regular collar, and a lot of jackets (and pretty much all sweaters) won’t work with it. 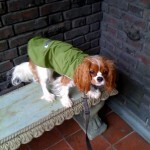 Here’s a good-quality one that will: The TeckelKlub Slicker (Chloe’s is olive green) has a waterproof exterior, a fleece-like lining, and sensible Velcro fasteners at neck and belly. Apparently the exterior is also breathable, which is a fine thing. It looks great, Chloe moves comfortably in it, and it’s structured so the harness falls well below the neck fastener. I LOVE this blog. I’m about to pick up my new Cocker Spaniel puppy and a fellow Cocker forum member referred me to this site because we will be flying her home with us (in-cabin of course). Your tips and suggestions have been invaluable and I’m ordering a lot of new “accessories” based on your recommendations (the Scottevest, a large SturdiBag pet carrier, Dry Fur pet carrier inserts, Travelon Bag Bungee, Fold-N-Go collapsible bowl, a Gulpy Jr, and D.A.P. wipes to name just a few). I’m also planning to add an Easy Walk harness to the list but am wondering if the petite/small size will work for a 10-12 week American Cocker, or whether the small/medium would be better. I suspect she will weigh about 8-10 lbs when we pick her up. I think you said Chloe weighs about 13 lb. What size harness does she wear? Thanks so much for the praise and enthusiasm, Sherry! Your comment made my day. Chloe wears a size Small harness, and I suspect your pup will too, at least for a short while. Please let us know how the trip goes, and please send a pic! A Cocker puppy redefines enchanting…. Thanks, I’ll try the small. Got my SturdiBag and LOVE it. We’ll soon see what the pup thinks. We will be flying Southwest. Will send pics when I get some. Thanks again.